What if a Bearded Lizard Has Its Tongue Out? 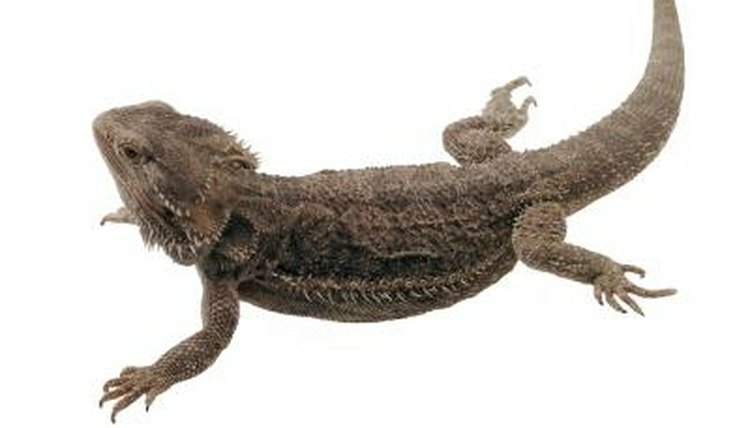 Native to Australia, bearded dragons commonly are kept as pets. If you own a "beardie," then you probably spend lots of time trying to figure out the ins and outs of his fascinating reptile body language. A bearded dragon with his tongue out often signifies that he's an inquisitive creature. If you notice your bearded dragon with his tongue out, he's probably investigating his surroundings. This entails swiftly flipping the tongue in and out of the mouth, and then lightly employing the tongue to feel unfamiliar objects. This is how bearded dragons get acquainted with new places and things. If you move to a new home and notice that your pet has his tongue out of his mouth often, it's because he's learning about your new digs. Although bearded dragons frequently depend on their tongues to get their bearings in strange new settings, they don't usually stick out their tongues to analyze whether a food item is appropriate for dining. You probably won't see a bearded dragon stick his tongue out around an insect or plant, for example. When they feel the need to investigate food, they utilize their eyesight. Bearded dragons differ from monitor lizards and snakes greatly in this arena, as the other two varieties of reptiles often prefer using their tongues to check out food. Bearded dragons often have their tongues showing prominently when it comes time to enjoy meals. When food gets into a bearded dragon's field of vision, it usually triggers him to open his mouth up immediately. This action makes way for the tongue, which promptly pushes itself to the front. The tongue has a gooey texture and is capable of drawing food inward. Once the prized food is situated inside of a bearded dragon's mouth, he can use his tough jaw and teeth to keep it all secure. If your bearded dragon's mouth is ajar and you can see his tongue, it could just denote normal basking. Bearded dragons typically thrive with body temperatures anywhere between 95 and 110 degrees Fahrenheit. When bearded dragons attain ideal basking temperatures, they often react by "venting" or "gaping." Gaping permits beardies to release any heat they simply don't need. Always make sure your bearded dragon's living environment is equipped with a temperature gradient. These gradients provide bearded dragons the opportunity to switch spots once they get to certain temperatures, if necessary. What Do You Need for a Veiled Chameleon? How Can I Tell If My Guinea Pig Is Growling or Cooing? Why Is My Bearded Dragon's Tongue White? How Do Desert Turtles Adapt to Their Land? What if My Boa Constrictor Gets Sick? What Does it Mean When a Guinea Pig Squeaks a Lot? What Happens When a Hamster Squeaks? What Does It Mean When Your Dwarf Hamster Chirps? What Is Unusual About a Chameleon's Eyes? Why Do Millipedes Smell So Bad?